The previous posts covered all of the “plain” brownies, some of which had nuts or chocolate chunks in them but none of which had any sort of topping applied. I did all of those brownies first before starting on the brownies with toppings, because I could be fairly sure that some of the toppings would take on undesirable textures if they were frozen — indeed, some of the recipes specifically recommend storage in the refrigerator rather than either room temperature or freezer, and I had to make enough room in the fridge to fit them all. The first two recipes with toppings that I made were Carole Bloom’s “Caramel Swirl Brownies” ( Caramel , Gibbs Smith, 2013; p. 73) and Mindy Segal’s “Barter Brownies” ( Cookie Love , Ten Speed Press, 2015; p. 217). Both have toppings that are slightly unusual for brownies: Bloom’s is unusual for being swirled with the batter (most caramel brownies have it just spread on top; compare cream-cheese brownies), and Segal’s is a mixture of melted milk chocolate and cocoa-flavored puffed-rice breakfast cereal. I’ll start with Bloom’s recipe. 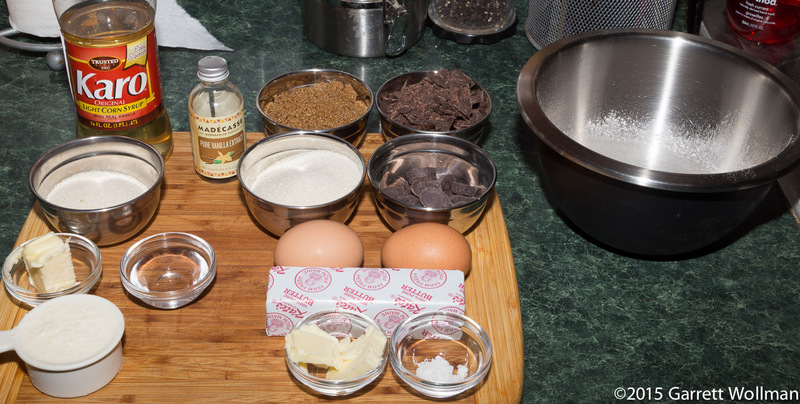 Starting with the usual mise en place; the ingredients in the caramel — sugar, cream, corn syrup, and butter — are on the left, and the brownie ingredients (including light brown sugar) are on the right; vanilla is used in both. The chocolate flavor here comes from a combination of bittersweet chocolate (my notes say TCHO 66% baking discs, which is at the low end of Bloom’s suggested range, but from the photo above it appears likely that I used Callebaut 70% instead) and unsweetened chocolate (TCHO 99%). 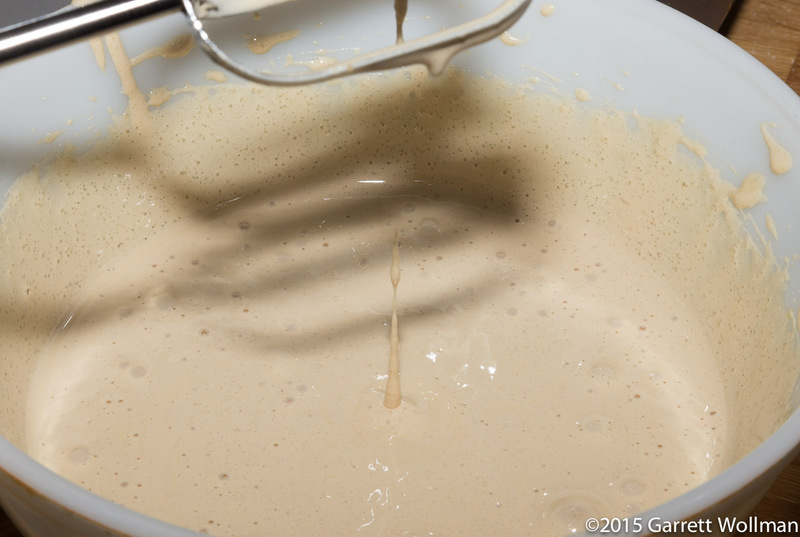 Both brown and granulated sugars are used, but no leavening. The caramel is prepared on the stovetop in the usual way, which is not very photogenic so I’m not showing it here. Bloom tricked me into using softened butter rather than baking spray to lubricate the pan by calling it out separately in the ingredients list, which (as a result of the way the cookbook was designed) is on a separate page from the main body of the procedure. The recipe explicitly calls for a foil sling, so that’s what I used. 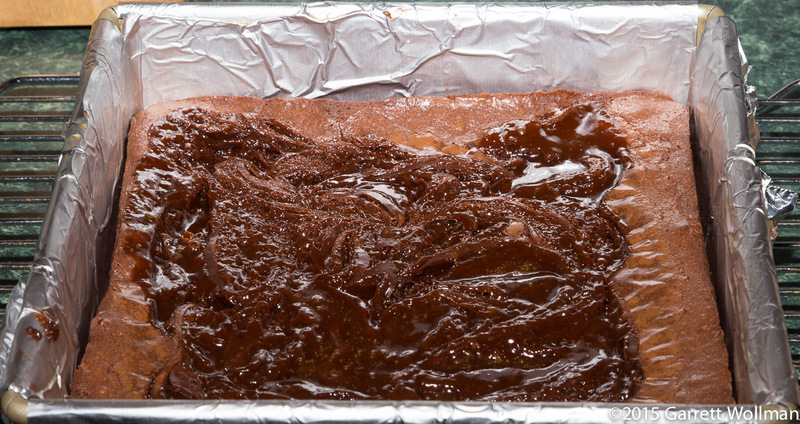 After the batter is added to the pan, the previously prepared caramel sauce is poured on top and swirled with the brownie layer. I didn’t do a very good job of this, so the caramel formed more of a puddle than a swirl design. 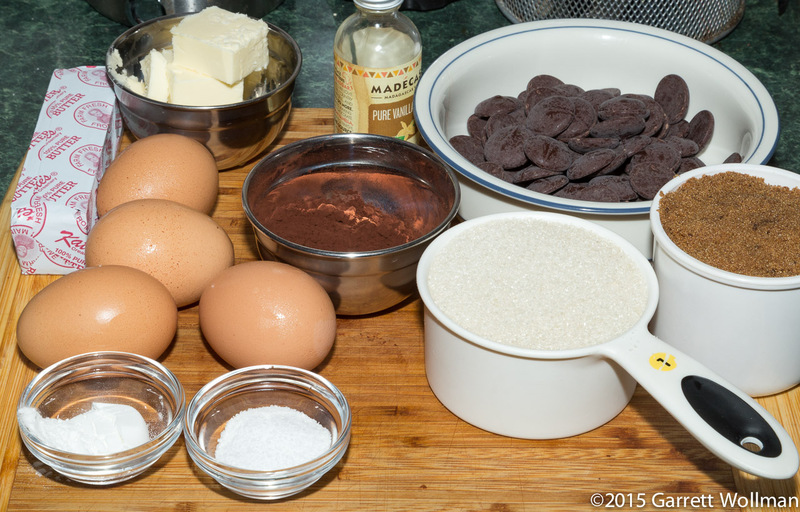 Segal’s “Barter Brownies” are the result of a recipe swap she did with another Chicago-area pastry chef. This recipe has a couple of fairly unusual features, aside from the odd puffed-rice topping (Segal’s own addition): it uses extra-large eggs — most baking recipes are written for large eggs — and it calls for dark brown sugar (I of course used more dark muscovado). These brownies are leavened, and actually contain a significant amount of flour; the chocolate flavor comes from a combination of bittersweet chocolate (again, TCHO 66% discs) and Dutch-process cocoa (my usual Valrhona). Construction is by procedure #1. 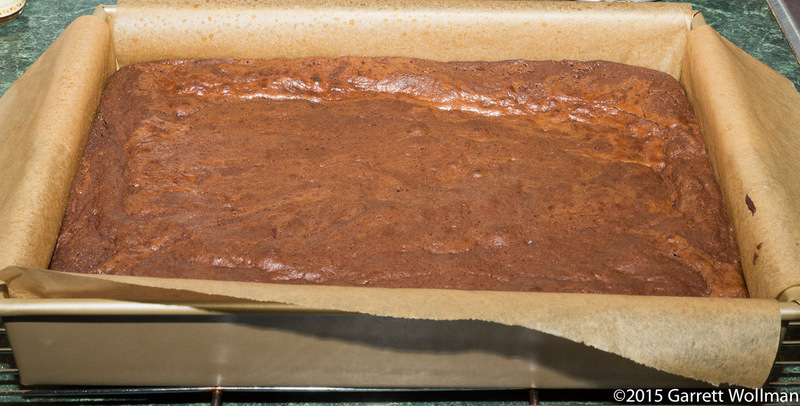 After baking, Segal’s brownies look pretty ordinary. The puffed-rice topping is made from a combination of chocolate-flavored puffed rice (I used a weird sprouted puffed brown rice with cocoa flavor that I found at Whole Foods) and melted milk chocolate (TCHO 39% milk chocolate discs). The photo above shows the result after chilling. Segal suggests, rather than the usual square portions, cutting these brownies into “candy bar” shapes, 1 inch by 4½. Both recipes qualify as “A Low Sodium Food” under FDA regulations. This entry was posted in Food and tagged browniefest, brownies, caramel, Carole Bloom, chocolate, Mindy Segal, recipe. Bookmark the permalink.